Cosmetic Contact Lenses Market size is set to exceed USD 1.3 billion by 2024; according to a new research report by Global Market Insights, Inc. Growing usage in entertainment sector is expected to boost cosmetic contact lens market size. These lenses are primarily utilized in the entertainment industry owing to the need for more dramatic makeup. Increasing customer inclination towards colored contact lenses will further drive the segment demand. Growing disposable incomes encourages consumer purchasing power on lifestyle products, thus supporting the contact lenses demand. 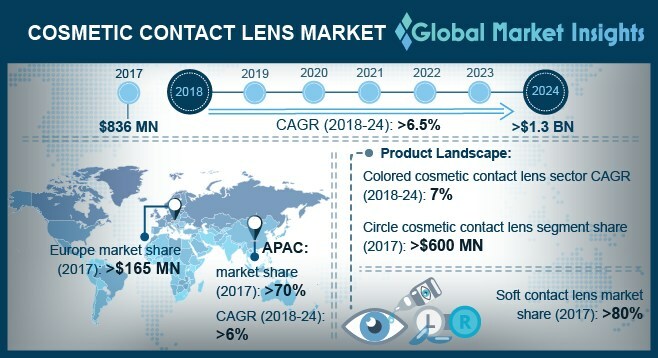 Surging penetration through online medium coupled with the relaxation in regulatory approval is expected to boost cosmetic contact lens market size. The FDA characterizes these products under the medical devices category and mandated prescription for purchase A noteworthy upturn in light of swelling demand for altering the aesthetic appearance and growing disposable income are the supporting factors driving the market growth. Circle product segment accounted for over 70% revenue share in 2017 owing to the availability of diverse designs coupled with its ability to blend in naturally with the usual appearance of eyes. This segment has gained tremendous popularity over the last few years among the teens and young adults’ population. RGP segment will witness significant gains at approximately 6% over the forecast period. This can be attributed to associated benefits such as high oxygen permeability, sharp vision, durability, and cost-effectiveness. Other noticeable factors include moving capacity, smooth surface, and ability to maintain shape are fueling the business growth. Online stores distribution channel segment is expected to account for over 20% revenue share by 2024. These stores provide products at lower prices along with on-time delivery which will foster new opportunities for the industry growth. Spherical design segment will grow at over 6.5% from 2018 to 2024 owing to factors such as enhanced clarity in vision and correction of conditions such as nearsightedness & farsightedness. These product designs offer high level of comfort and customization which further support the business growth.